Dante's Pizzeria (in former Atlas Cafe spot) opened on Sept 5. They do NY Style pizzas, and they only come in a 20" size. Prices are $18 + $2 or $3 for each topping and they have quite a few specialty pizzas as well (think roughly $22-26). I went with a standard cheese pie, which was REALLY good. Nice spice to the sauce, greasy/salty cheese (this being a positive) and a chewy, foldable crust. They also have hot/cold subs, panzerotti and salads. Great addition to a pizza wasteland! Me being from New Jersey and Dante's being halfway between work and home, I've been anticipating it's opening. I'll report back once I give it a go. From wiki: "Panzarotti or panzerotti are filled pastries, different forms of which are popular in Italy and in the United States, especially in Southern New Jersey." Ordered 2 pizzas this past weekend: a cheese pie and one with broccoli rabe, sausage and ricotta. The edge crust was much better this time. It was more rounded, whereas the first time it was more flat. Guessing there will be a continued breaking-in period, but at the moment the pizzas are still fantastic. As mentioned above, I'm from New Jersey. No, I don't tan. No, I don't have gelled hair. And no, I don't have tribal tattoos. I will admit however, that our after-prom party was in Seaside Heights (Jersey Shore), and I got my hair cut at The Gatsby (Jersylicious). I will also admit that the pizza I grew up with is what I consider to be the best pizza...as it should be. Dante's had it all going on, and I think it might be the best pizza I've had in four years of living in Chicago. The sauce was fresh, abundant and flavorful. The cheese was salty and used with restraint. The dough...holy s***...the dough. Texture was crunchy, chewy and moist. So much flavor. If they turned that dough into a loaf or baguette, I would buy it daily on my way home from work. I talked to some other Jersey transplants, and so far, we all agree that Dante's is where it's at. Had a cheese slice for lunch today at Dante's. While this is small sample size, I will say that the slice was very good. 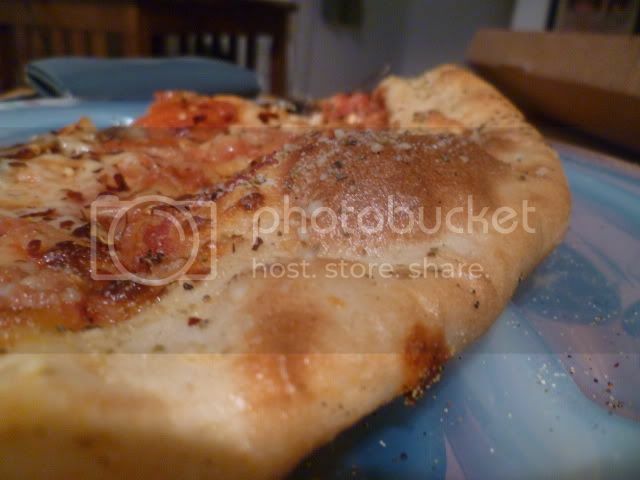 It had a rich, flavorful sauce, nice cheese, and truly a perfectly foldable crust. They are have a special where you get a slice, a small salad, and a can of soda for $7. The side salad had nice, fresh greens, tomato, cucumber, and red onion. I thought this was a decent value. I look forward to getting a group together to try one of the full-size pies. Some of the specialty pies sound like they could be pretty good. I'm a southside pizza guy. I grew up with crispy square cut "tavern" style pies and pan style. I also dig traditional wood fired or coal fired pies. 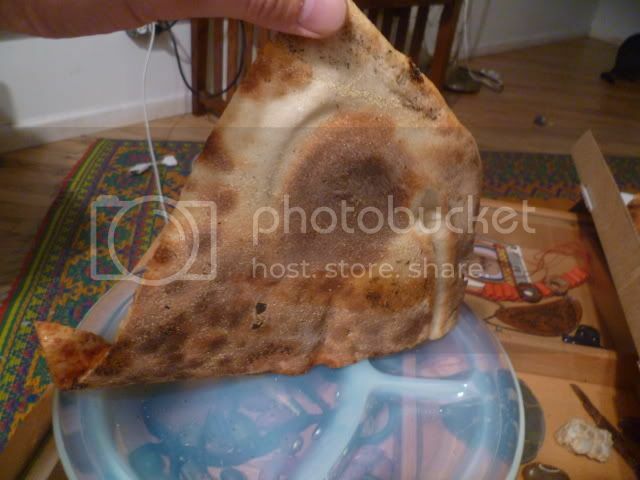 The foldable, chewy crust thing has never been my ideal pizza. When I think of that style it recalls the rubbery, corporate junk that I ate at childhood sleepovers. I've had some pretty great pies in the charred, high heat fashion out east, but the whole slice thing is lost on me, I want my pizza cooked fresh, thank you. The very fine pizza at Dante's just might have convinced me of the beauty of the East Coast chewy crust style. One of the owners of Dante's is an old buddy of mine and I was thrilled when they opened up shop this year. I'd never had Jersey style pie, but my Brooklyn native buddy had declared their pizza as the best NY style slices in the city. So, it was high time to pay Dante's a visit for take out this evening. My girlfriend's favorite food is pizza and I'm not sure if it was the hunger talking, but she actually proclaimed that this was the best pizza she'd ever had. It was pretty damned good. The sauce was bright and pronounced, the cheese was definitely high quality, stringy and salty. The crust was fantastic with crunch on the bottom and edges, yielding a toothsome chew with the occasional bubble. The edges seemed to be brushed with oil or butter and a sprinkle of parmesan and dried herbs. Other toppings were applied with a judicious hand, which I appreciate. We had a house salad too, which was not much to mention. The pie, alone, will have us returning pretty soon I imagine. Worth noting is that they only serve in one size 20", cut into 8 quite large slices. After two slices each we were plenty full, but it was so delicious that we had to split a third piece. These pies will feed three to four. Jefe wrote: I want my pizza cooked fresh, thank you. Its pretty damned tasty reheated the next day as well. Jimmy's Cafe and Dante's have both gotten quite a bit of LTH love lately for being good representations of NYC (or NJ) -style pie, so I thought I'd give them both a try in the span of a couple days. While I liked both very much, to me, Dante's was easily the better pizza. The slices I had were bigger, floppier, and tastier. I'm no NYC pizza expert, so I'd be curious to know how others think the two places compare. Since I went to both, I've returned to Dante's twice. Holy moley it is good. And it also deserves more lunchtime customers. I also gave both Dante's and Jimmy's a try over the past week. I really liked both, but I think Jimmy's is superior. The dough is just head and shoulders above any other in Chicago, in my opinion. As I get older, that has become the most important part of the pizza to me. In my younger days, I might have gone a pizza like Dante's, which I will admit has a bit more flavor to the sauce, and saltiness to the cheese. But, I find myself craving Jimmy's every time I think about it so it gets the nod from me. Sounds good, I'll check out both places. Jimmy's easily, and it's not even close imo. I appreciate dante's and hope it does well, they serve a very respectable pizza. Their slices are large and prices low. But for a more authentic ny style slice Jimmy's is tops in Chicago for me. Got a half sausage, half roasted red pepper last night. Still my favorite pizza in Chicago; and this in the wake of a long weekend in NJ/NY/CT. If you haven't been, give it a shot. If you like East Coast style (not necessarily New York), head east down Armitage Ave and try Armitage Pizza. Sweetbread wrote: Got a half sausage, half roasted red pepper last night. Still my favorite pizza in Chicago; and this in the wake of a long weekend in NJ/NY/CT. I stopped in here about a month ago -- my first visit -- for a late-night slice and thought it was excellent, far exceeding my expectations. Even though the slice was reheated, the crust had a light and crispy texture with a lingering, flavorful chew. The toppings -- sauce, cheese and sausage -- were all tasty and nicely balanced. I really enjoyed that the sauce wasn't sweet and that the cheese had a pleasant saltiness that wasn't over the top. Sausage had great flavor and aroma, and nice definition. I'd definitely stop in here again, without hesitation. In fact, I hope to try part of a whole pizza, cooked to order, sometime in the near future. A little off topic, but I have a general question about NY/NJ pie. As a kid I moved from Boston to Chicago. I quickly fell in love with the crispy thin Chicago style pizza with its tangy sauce. I must say I was a little confused by the square cut, but now I understand how it contributes to the overall style. I wrote off East Coast Pizza as being a rubbery greasy slippery and sweetish mess. 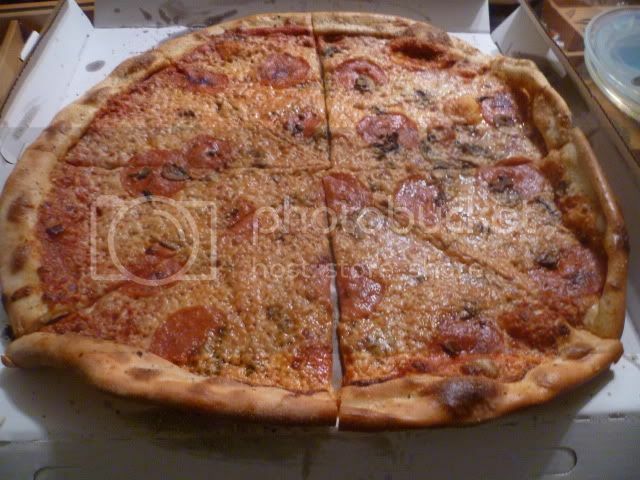 On visits to New York I was pretty unimpressed by the "pizza by the slice" I tried. Now I realize I was eating what I call "subway pizza", a cheap and pale imitation of the real thing that you grab from a stand for a quick and cheap fill-up. On subsequent visits to NYC, I sampled a more sophisticated variation, made with better ingredients, and learned to appreciate the style. Now my question is, there is a certain flavor that is present in the better New York pizzas. It is hard to describe, but it is not present in Chicago pizzas, it is sort of buttery and a bit bitter, but not really. What is it? I know that is very little to go on, but I notice the flavor or lack of it right away. Is it from olive oil? Do they sprinkle the pizza with olive oil, or put it in the crust? Am I tasting the difference between good and crappy olive oil? Or is it the types and quality of the cheese? It could be from provolone. Just curious. Ideal Machine wrote: Jimmy's Cafe and Dante's have both gotten quite a bit of LTH love lately for being good representations of NYC (or NJ) -style pie, so I thought I'd give them both a try in the span of a couple days. ..... Dante's was easily the better pizza. I did the same type of approach, had both Dante's one day & Jimmy's Cafe the next in order to be able to compare. I also agree that Dante's is easily the better pizza as the crust was chewier w/some nice blister, sauce was bright, sausage was delicious. The unexpected hit of deliciousness at Dante's were the homemade poppers stuffed w/poblano peppers, cream cheese, bacon & red onion. I'll have to try Dante's out at some point. I live closer to Jimmy's myself, and already really was fond of that place(need to try their white/ricotta pizza out next time I'm there). Would definitely be up for trying Dante's the next time I find myself near Armitage/California. Sounds like when I return, I could kill 2 birds with one stone, and also go for a pie slice at Bang Bang(another place I've heard so much about). I was able to stop by Dante's recently to grab a slice. Unfortunately it was woefully overcooked. The crust was crunchy and hard to fold and the cheese on top was hard and rubbery. It was hard to judge the slice under the circumstances, though it did seem to me that the sauce and the crust were pretty bland. I'd give it another go, but maybe you're better off ordering a whole pie. turkob wrote: I was able to stop by Dante's recently to grab a slice. Unfortunately it was woefully overcooked. Saturday at about 9PM. The place was full but not slammed. Dante's just opened down the street from me in Lincoln Square. I tried a sausage and pepperoni slice (1 each; they are large) and they were excellent, in sauce and crust especially. I hate to say better than Jimmy's (the white pizza there is my favorite) but it might be. Considering that I have tried my old pizza spot in Pittsburgh (Mineo's, highly recommended) and found it to match my childhood memories, I'd say this is also recommended. It's not "hipster pizza" but a solid, flavorful addition to the neighborhood. I will return to try the stromboli, among other things on the menu. Oh, Dante's crushes Jimmy's! Everyone* agrees on this! This is nuts! If it "crushes" (and not just narrowly beats) Jimmy's, then this is where I'm getting dinner tonight. Behavioral wrote: This is nuts! If it "crushes" (and not just narrowly beats) Jimmy's, then this is where I'm getting dinner tonight. It's been a while since I had Dante's but I definitely remember this being the case. Dante's has a superior crust, in which the flavor lasts all the way through the chew. This is a pretty stark contrast relative to Jimmy's. Dante's sauce, cheese and toppings are better, too. Is the Lincoln Square location the pop-up in the old Vidalia space at 1964 Lawrence? The GP wrote: Is the Lincoln Square location the pop-up in the old Vidalia space at 1964 Lawrence? Just to be clear, my only experiences with them have been at the Armitage location in Logan Square and the Milwaukee Avenue in Avondale. Ideal Machine wrote: Everyone* agrees on this! I do not agree. I've only been to Dante's (non-Lincoln Square locations) twice, and both times the pizza was good but not better than Jimmy's. One of those times the wait time quoted was woefully off, which may have influenced my evaluation. Note I consider Jimmy's the top pizza in that area. I've yet to have any New York style slices in the entire Chicago area that impress me. All are pretty good, but all of them seem to let me down with the overall pizza (especially the sauce). Jimmy's, Dante's, Dimo's, NY Slices (Highland Park) to name a few - come on - someone step up and blow me away. All I hear is how incredible New York (street/gas oven, not the coal oven variety) pizza is and I'm still waiting. Ram4 wrote: I've yet to have any New York style slices in the entire Chicago area that impress me. All are pretty good, but all of them seem to let me down with the overall pizza (especially the sauce). Jimmy's, Dante's, Dimo's, NY Slices (Highland Park) to name a few - come on - someone step up and blow me away. All I hear is how incredible New York (street/gas oven, not the coal oven variety) pizza is and I'm still waiting. Might be a little out of left field, but for a slice shop, I've enjoyed NYC Bagel Deli (the one in River North). Really satisfying chew and good slice all around. Though I remember the sauce being a bit thin/weak, so you might feel the same disappointment with the other pies you mentioned.